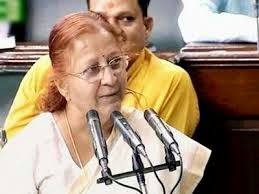 Sumitra Mahajan elected Speaker of the 16th Lok Sabha, becoming the second woman presiding officer of the Lower House after her predecessor Meira Kumar. 71-year-old Mahajan, the longest-serving woman MP, was elected after a motion moved by Prime Minister Narendra Modi and seconded by BJP veteran L K Advani was adopted by voice vote called by Protem Speaker Kamal Nath. Mahajan was led to the Speaker's Chair by the Prime Minister, Advani, Anant Geete, M Thambidurai as also a number of opposition leaders including Mallikarjun Kharge, Mulayam Singh Yadav and Sudip Bandyopadhyay, besides Parliamentary Affairs Minister M Venkaiah Naidu. Mahajan will be the second woman after Meira Kumar to be elected as Lok Sabha Speaker.